With the release of The Crew® 2 Demolition Derby, we are introducing a variety of new fixes and improvements to your game experience. This patch will be deployed on December 5th at 12:30pm Paris time on all platforms, after a short maintenance of our servers, and will be automatically downloaded when live. Please follow our official channels for the latest information. Check out the most notable changes with Patch 1.2.0 below. 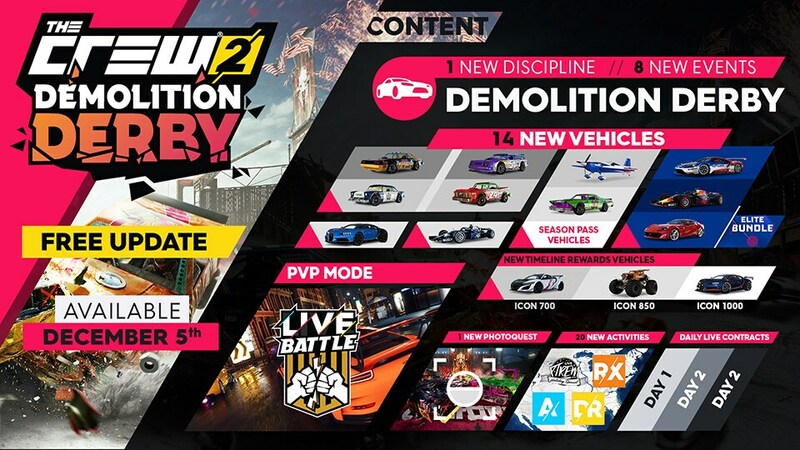 For more information about the main features & content coming with this free update, check out our dedicated articles about The Crew® 2 Demolition Derby and the newly introduced Live-Battle PVP mode. In addition to the December vehicle drop and 4 Demolition Derby vehicles, we’re thrilled to reveal the final 8 new vehicles added with this update! Don’t forget that Season Pass owners have a 20% discount on all purchases! With the introduction of the Live Battle PVP mode, it was important for us - in addition to our current efforts on the leaderboards cleaning - to develop a fair competitive experience to all players. To do so, the dev team has been working on an update of the vehicle collision model (see below for more information), which includes an important focus on the impact of obstacles to your vehicle speed and behavior. Indeed, where it was sometimes more effective to bounce head-on off a wall or slide along it thanks to limited friction, the game will now encourage players to use the best trajectories to get the best results. We will continue to improve this model through further updates. With this improved collision model, we also reworked the behavior of vehicles when bumping into static elements or traffic. Our objective is to offer a more realistic behavior that would offer a coherent reaction based on the impact source and strength. For instance, traffic cars’ behavior following a hit will be more predictable and should no longer overlap the player’s vehicle. We also improved the deformation model to better reflect player’s driving style and reduced dramatically the crash cam occurrences, along with a reduction of the Back-on-Track time. Vehicles will automatically repair over time when not being hit or whenever you join an event. In our will to continuously improve the driving sensations of the game, we are introducing a reworked version of the Rally Raid vehicles handling. Vehicles are no longer being forced back on the track, especially when being on air, leading to longer jump times and potentially rocky landings. The drift sensations are being improved on both asphalt and dirt, giving you a more challenging gameplay experience where your trajectory really matters. Our goal was to provide a more realistic feeling but worry not, low v-level performances have also been boosted to make sure you will not remain stuck in slopes! To provide a better experience at any time of the day, we have also been working on the illumination system of the game. To do so, we improved both the way lights are now projected but also how they are displayed to the player, reducing visual gameplay obstructions. A gamma slider is now available in the game menu to allow players customizing their display preferences, this one will be prompted at your next game launch. With the great variety of events and the FastFav feature, our objective is to offer the best experience for all motorsport enthusiasts. With this update, we will be introducing a new feature allowing PC players to customize their key mapping for each type of vehicle. Behavior & feeling is very different between a car or a plane for instance, you will now have the opportunity to completely adapt your controls accordingly. The driving wheel Logitech G920 is now also officially supported in The Crew® 2. Available since the release of The Crew® 2 Gator Rush, the The Crew Hub platform is also evolving on December 5! In addition to a revised “Best” sorting algorithm, to better promote quality content from the community, we will also be adding new features and improvements to this page. Filters are now available, allowing you to only display screenshots featuring specific families, type of vehicles or even brands! A search feature is also accessible to check your favorite artist creations. Your gallery is also evolving with all your favorites and friends’ screenshots, check it out at https://thecrew-hub.com! • [Improved] Improved AI overall behaviour (during & outside events). • [Improved] Improved Seamless AI behaviour (e.g. on circuits etc.). • [Fixed] AI “Back-on-Track” issues. • [Improved] Reduced “Back-on-Track” duration. • [Improved] Vehicles are less likely to climb some railings in curves. • [Improved] Rally Raid handling rework to reduce stabilization assistances and increase vehicle weight feeling on drift control. • [Improved] Improved Pilatus handling and follow cameras (both Aerobatic and Air Race). • [Fixed] Jetsprints' camera clipping when falling on water. • [Fixed] The camera passes through the vehicle when zooming in the Livery editor. • [Fixed] The camera is snapping when entering or exiting a loop ram. • [Fixed] Boat Weight Distribution pro-setting generating physic inconsistency. • [Fixed] Plane Reactivity pro-setting generating physic inconsistency. • [Fixed] Vehicle going below the map when using FastFav on high slopes areas. • [Fixed] Vehicle pointing in the wrong direction when using FastFav during a backflip. • [Fixed] “Wrong-way” notification when using FastFav after setting a waypoint. • [Added] Introduce deformations on all ground vehicle when colliding static elements or traffics cars. • [Improved] Improved traffic vehicles behavior and stability when being collided by a player. • [Improved] Improved stationed vehicles behavior and stability when being collided by a player. • [Improved] Improved cameras’ shakes on collisions for Cars, Bikes and Boats. • [Improved] Improved restart after heavy collisions on 4WD vehicles. • [Improved] Sliding and bouncing off walls impairs speed. • [Improved] Reworked vehicle collisions to offer a more consistent behaviour. • [Improved] Collisions with trees should no longer send the car sideways. • [Improved] Crash Cam Crash triggers reviewed. Crash-cam should now trigger less frequently. • [Improved] Vehicles deformations do not reset after entering/exiting main menu or Photomode. • [Fixed] Hovercraft crash cam should no longer trigger in loopings. • [Fixed] Fast-fav exploit to get under the map. • [Fixed] Followers exploit related to highlights. • [Fixed] “Infinite drift” exploit fixed on the Charity Event. • [Added] Daily Contracts feature. • [Added] Live-Battle PVP Mode. • [Added] Once the prologue is completed, the player is now prompted with an in-game screen introducing him to the Live-Battle PVP mode. • [Fixed] Remaining ghost's visual FX in Photo Mode. • [Fixed] Incorrect message displayed when photo-sharing process is cancelled. • [Improved] Replay now starts at the same position as the My-Path cursor. o Added “currently selected” visual effect to the timeline. o Added D-Pad visual element to better explain how to travel through the timeline. • [Improved] Improved tips & key mapping display. • [Improved] Move the "Car Noir" filter to the first place in the Post FX – Style menu. • [Improved] Event props are now visible in replay mode after completion, Demolition Derby’s traps included. • [Improved] In the Video Editor, the "Mud on vehicle" option can now affects all vehicles. • [Fixed] Camera is locked when leaving replay mode and returning to the game. • [Added] Added filters into the BEST screenshots category to sort photograph by: Family, Vehicle category (air/ground/sea) or Brand. Player search also is also now available. o You can now see all the screenshots you liked. o You can now delete your own screenshots directly from the website. o You can now check the screenshots of your friends directly from your gallery. • [Improved] Improved “Best” sorting algorithm to better promote quality content from players. • [Improved] Improved “My Friends” page to give users the possibility to check specific friend galleries. • [Added] New bundle & new vehicles (see new vehicle list). • [Fixed] Incorrect Crew Credits value display after purchase. • [Fixed] Game crash after repeated use of “Return” button from the shop. • [Fixed] The game may remain stuck after buying a vehicle bundle. • [Fixed] Invite to the crew option is inaccessible when a timer is displayed. • [Fixed] Crew members are unable to return to freedrive until leaderboards screen is closed. • [Fixed] Blank persistent notification may appear when playing in a Crew. • [Improved] Improved various event paths. • [Improved] Improved Ace difficulty to offer a more balanced and challenging experience. • [Improved] Improved mini-map in Events. • [Fixed] Fixed various assets issues during events. • [Fixed] Fixed various cinematics issues during events. • [Fixed] Fixed various barks inconsistencies. • [Fixed] Lightning and Exposure obstructions affecting the visibility of Events. • [Fixed] AI performing “Back-on-Track” repeatedly during certain events. • [Added] Added Demolition Derby Discipline. 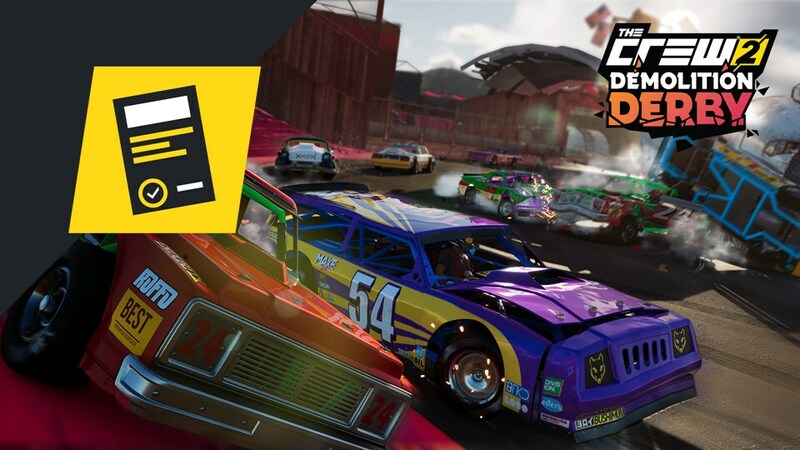 • [Added] New Demolition Derby photo ops set, including 8 new photo Ops to dive into the demolition derby spirit. • [Added] Added Holiday Special Live Event. • [Improved] Players are now able to skip Live Xtrem Series cutscenes. • [Fixed] Persistent score notification after beating a drift skill world-highlight. • [Fixed] Unable to complete an escape skill after performing a “Back-on-Track”. • [Improved] AI avoids other vehicles and obstacles more efficiently. • [Improved] Realigned fences to avoid invisible collisions in turns. • [Improved] Moved pylons that were too close from circuit path. • [Improved] Moved parked vehicles stopping players after a jump. • [Improved] Moved parked vehicle and construction signs stopping players on a turn. • [Fixed] “Wrong Way” notification inconsistent display. • [Improved] Removed flowerpots blocking player’s path. • [Improved] Realigned building facades to avoid invisible collisions in turns. • [Fixed] Bikes not stopped by fences. o A Tour With Alexis - Golden Hills. o A Tour With Alexis - California. o A Tour With Alexis - Florida. • [Improved] Invisible collisions improvements. • [Improved] Improved placement of assets on several Drift Events. • [Improved] Increased ACE difficulty challenge for BELLFLOWER Event. • [Improved] AI avoid other vehicles and obstacles more efficiently. • [Fixed] Inconsistent “Wrong Way” notification display during Hypercar Events. • [Improved] Improved “Back on Track” placement in LATRELL’S CAR PART 2 event. • [Improved] Improved mini map’s ribbon accuracy during Rally Raid Event. • [Balancing] Ariel Nomad performances balancing. • [Fixed] Flying asset can be noticed during the Portfoliage Event. • [Fixed] MERCEDES-BENZ X-CLASS vehicle might be displayed twice in the vehicle selection menu. • [Improved] Reduced checkpoint gates glow intensity during night events. • [Improved] AI avoid obstacles more efficiently. • [Improved] Improved mini map’s ribbon accuracy during Motocross Events. • [Fixed] Short finish line trigger range during WOLF TERRITORY Event. • [Fixed] Event may be triggered unintentionally when freediving close to it. • [Improved] AI has a better control of the Hovercraft and can avoid obstacles more efficiently, especially in ACE mode. • [Improved] Improved ACE difficulty challenge during Powerboat events. • [Improved] Improved AI avoidance of other vehicles and obstacles in ACE Difficulty. • [Fixed] The Mini map’s ribbon of the MISSISSIPI EVERYZON Event is not correctly updated during the race. • [Fixed] Invisible collision in THE GIANT CHAEBUNG CUP Event. • [Fixed] Misplaced arrows in THE GIANT CHAEBUNG CUP Event. • [Fixed] Some events may be triggered unintentionally when freediving close to them. • [Improved] Resized colliders to improve collisions in tunnels. • [Fixed] Incorrect “OUT OF ARENA” notification prompt during LAS VEGAS WATERWAY Event. • [Fixed] Incorrect mini map indicator updates during the COLORADO RIVER BANKS event. • [Fixed] Brightness is too high during countdown cinematic in cockpit view. • [Fixed] Player is respawned to the starting area of the StormX Arena when performing a “Back-on-Track”. • [Improved] AI has a better control of the vehicle an avoid obstacle more efficiently in the WRECK AND HAVOC Event. o Central Valley Endurfix Event. • [Improved] Added fences to avoid players going out of tracks too easily. • [Fixed] Various visual fixes & improvements. • [Fixed] Wheels rotation inconsistency depending on vehicle distance. • [Fixed] The odometers of the Audi TT RS Coupé and the Alfa Romeo 4C are now functional in cockpit view. • [Fixed] Custom liveries are now enabled on the Cadillac Escalade. • [Added] Added Gamma sliders on all platforms. • [Improved] Improved overall illumination model. • [Improved] Improved Night visibility. • [Fixed] Fixed various lighting issues. • [Fixed] Fixed tunnel visibility issues, especially during night time. • [Added] Added DEMOLITION DERBY Playgrounds. • [Fixed] Fixed various landscape issues. • [Fixed] Fixed various missing roads issues. • [Fixed] Various collision issues. • [Fixed] Various graphic issues. • [Fixed] Incoherent shop fronts. • [Fixed] Various visual glitches. • [Fixed] Various floating objects. • [Fixed] Various terraforming issues. • [Fixed] Various occlude issues. • [Fixed] Various level design issues and incoherent objects placement. • [Improved] Improved pilot behaviour, especially during collisions. • [Fixed] Low quality textures in the distance (city view) when exiting Miami House. • [Fixed] The helicopter may be submerged in the ground. • [Fixed] New vehicle layout is not saved upon exiting and re-entering HQ. • [Fixed] Plane's propellers and Car's wheels can be seen rotating while in the map with a near camera. • [Improved] Added character names in subtitles. • [Improved] Improved barks system. • [Fixed] Narrative sentences triggered only during the first try. • [Fixed] Subtitles stay blocked on first line during cutscenes. • [Fixed] Exposure issues during various cutscenes. • [Added] Added Demolition Derby segment in Boot menu. • [Added] Ability to select materials for liveries: Standard, Metallic, Chrome, Matte and Anodized. • [Fixed] Customized callipers could appear faded after exiting the house. • [Added] Added 1 brand new demolition outfit. • [Added] Added 7 hovercraft outfits variations. • [Added] New vehicle rewards in the timeline (level 700, 850 & 1000). • [Improved] Performance parts affix values are now “rounded” instead of having one decimal value. • [Improved] Some performance part affixes no longer appear depending on discipline (e.g. : no more “Bulldozer” in Drift discipline). • [Balancing] Affix “Lucky”: update of minimum & maximum values, from Max 56 to Max 175. • [Balancing] Iconic Perk “Lucky”: update of minimum & maximum values, from +0.1%/point to +0.2%/point. • [Improved] Live Crates & Timeline rewards will no longer give inferior level performance parts. • [Improved] Reduced default Collision avoidance. • [Improved] Affix “Bumper”: update of minimum and maximum values. • [Added] Added event result (timing or score) after completion. • [Improved] Activities & News menus update to include Live-Battle & Daily Contracts shortcuts. • [Improved] Improved interface overall memory usage. • [Improved] Added HOLD button detection (push/release). • [Fixed] Game may crash after swapping between vehicles and returning to game. • [Fixed] Game may crash while scrolling the Main Menu options. • [Fixed] Vehicles may appears behind the catalogue menu when vehicle options are switched fast. • [Improved] Various online, performance & stability improvements. • [Improved] Optimization on Main Menu, to open faster and be more reactive. • [Fixed] Game crashes after switching languages from/to Asian languages. • [Improved] Improved multiplayer replication when colliding with other vehicles. • [Fixed] Resnapping effect for remote vehicles after big jumps. • [Fixed] Resnapping effect for remote vehicles when flipping back from the roof. • [Added] Added customised key mapping per vehicle type on PC: General controls, Ground vehicles, Airplanes, Boats.